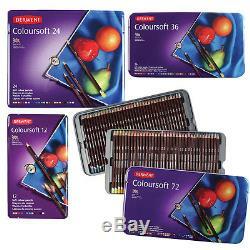 Coloursoft Tin Sets - 12, 24, 36 & 72. The softest of pencils, but in a strong and vibrant range of colours. The velvety softness of the core releases rich, dense colour at a stroke and is perfect for mixing and blending. Despite its soft texture, Coloursoft sharpens to a fine point and works equally well for detailed illustrations or bold, contemporary still-life drawings and portraiture. As the name implies, the Coloursoft art pencils have a soft, velvety colour strip, ideal for the quick and easy application of rich, dense, bold, vibrant colour. Deep Cadmium, Bright Orange, Red, Deep Fuchsia, Indigo, Blue, Green, Lime Green, Dark Brown, Dark Terracotta, Black and White. Acid Yellow, Deep Cadmium, Bright Orange, Red, Deep Fuchsia, Blush Pink, Bright Lilac, Royal Purple, Indigo, Electric Blue, Blue, Green, Light Green, Lime Green, Lichen Green, Dark Brown, Pale Brown, Peach, Ochre, Dark Terracotta, Black, Persian Grey, Dove Grey and White. Acid Yellow, Deep Cadmium, Orange, Bright Orange, Rose, Red, Deep Fuchsia, Loganberry, Blush Pink, Pink Lavender, Grey Lavender, Bright Lilac, Royal Purple, Indigo, Electric Blue, Blue, Cloud Blue, Pale Blue, Grey Green, Green, Light Green, Lime Green, Mint, Lichen Green, Dark Brown, Pale Brown, Pimento, Peach, Ochre, Dark Terracotta, Brown Earth, Black, Persian Grey, Dove Grey, Steel Grey and White. 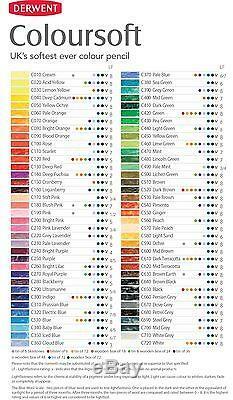 Complete set of colours - see colour chart in images for further details. Oversized items or items weighing over 2kg will be sent by courier. In some cases we may not be able to send, depending on location and weight of parcel in these circumstances we will let you know as soon as possible. While we take the greatest care with all our orders, if there is a problem or the item is damaged or faulty then please let us know and we will do what we can to help. Trading for over 20 years, our family run business offers a first class service to the professional, leisure, beginner artists and crafters throughout the UK and internationally. As a result The Art Shop Skipton staff are always on hand to offer an excellent, knowledgeable and friendly customer service. We stock a huge range of the very best art and craft supplies available and are main stockists of leading brands such as; Winsor & Newton, Daler-Rowney, Reeves, Pebeo, Derwent, Artmaster, Loxley, Unison and many more. Behind the scenes we work hard to ensure that we can offer these quality brands at the lowest possible prices. Whichever option you choose you will be guaranteed the same outstanding level of service. The item "Derwent Coloursoft Soft Colouring Pencil Tin Sets 12, 24, 36 or 72 Colours" is in sale since Monday, September 14, 2015. This item is in the category "Crafts\Art Supplies\Drawing & Lettering Supplies\Art Pencils & Charcoal". The seller is "theartshopskipton" and is located in Skipton. This item can be shipped worldwide.